When you spend time with Byron MacDonald, you quickly sense the peace in his life, as well as his love for the Word of God. That's what participants of A2/Bangladesh class 2 (and I) recently enjoyed. 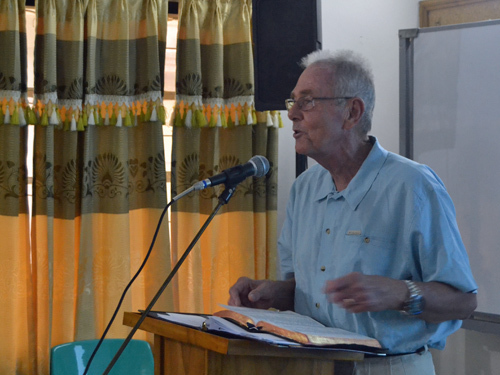 Pastor MacDonald ministered in Bangladesh for a couple weeks in August. He brought a team from his church Rolling Hills Covenant Church in an ongoing partnership with a national leader. They visited children at several orphanages and also trained many church leaders. It was evident to me that this congregation has been passionate about Bangladesh for quite a while. 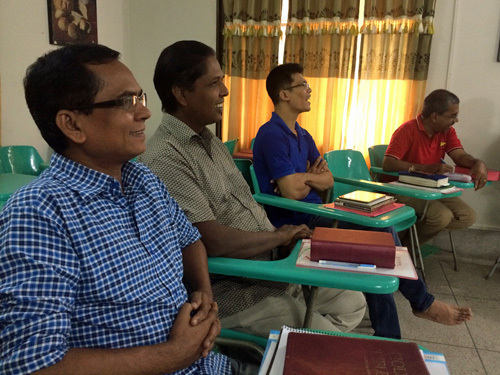 In his second week, Byron gave quality time to invest deeply in the lives of fourteen Asian Access/Bangladesh leaders. He led the group with an in-depth study of 1 John, teaching principles of hermeneutics—equipping them to be "workers approved"—and how to deliver God's Word to His people. I watched the leaders wrestle with interpreting passages and grow in drawing out practical principles from the text. It was a great week of learning! Asian Access is privileged to have high-caliber faculty with this kind of character, heart and passion. Our participants are fortunate to enjoy the teaching from these mature believers. You can hear deep admiration whenever the graduates all across Asia share of the impact of these faculty mentors. A love for the Word of God and a commitment to life-on-life mentoring are just two of the reasons I'm honored to serve with Asian Access. Here are just some of the faculty members in the A2 leader development program.